Lord Jagannath is a deity unique to Orissa, no other region worships a form of Vishnu like him. As Jagannath he is called the Lord of the Universe, of the three worlds of the heavens, earth and the netherworld. He is also one of the forms of Lord Krishna, the eighth avatar of Lord Vishnu. Jagannath possesses many of the qualities of Vishnu who is the preserver of the universe that has been created by Lord Brahma. So to his devotees Jagannath is kind and compassionate, patiently listening to their prayers and then offering them the joy of many colourful festivals and the most delectable offering of food. Jagannath is a protective and generous god and that is why he is so beloved of his devotees. This is a temple of truly ancient origins and it also possesses many unusual qualities. First, Krishna-Jagannath, his sister Subhadra and elder brother Balabhadra are worshipped at Puri, the only temple with the tradition of worshipping Krishna with his siblings. Then the icons in the sanctum look unique as they are not like the traditional depiction of Hindu deities. Finally the religious rituals and festivals have ancient traditions and have continued till today. The history and legends of the Puri temple are full of ancient stories that have been narrated for centuries and enrich the traditions of the Jagannath Temple. Many of the Puranas mention a tirtha named Purushottam Kshetra. The Agni, Skanda, Padma and Brahma Purana mention the myths about the temple. Both the Ramayana and Mahabharata also mention Lord Jagannath. In the Ramayana Lord Ram tells Vibhishan that Jagannath is the family deity of his Ikshvaku clan. Then Vibhishan is said to have composed a hymn praising the god and even today there is a ritual in the temple called ‘Vibhishan bandana’. The legends of the temple have intrigued historians and philosophers because hidden within the stories are the tribal origins of the cult of Jagannath. It is said that a long, long time ago, King Indradyumna ruled at Puri and Vishnu came in his dreams and asked him to build a temple for him. Indradyumna then began to search for the finest image of the god and heard of an image called Nilmadhav or the blue Krishna. Nilmadhav was the deity of the Shabar tribals who lived deep in the forests. The problem was that the image was hidden in a cave in the Nilachal Hills and only one man knew its location, a tribal chief named Vishwavasu. King Indradyumna sent a Brahmin youth named Vidyapati to find the idol. The clever youth married Vishwavasu’s daughter and then persuaded the chief to show him the idol. Then he took the image of Nilmadhav and brought it to Indradyumna. Discovering the loss of the image poor Vishwavasu was prostrate with grief and seeing his distress Lord Nilmadhav chose to return to his cave. However before returning, the god told the king to build the temple and then pick up a log of wood that would come floating in from the sea. This log had to be used to carve the image of the deity. When the temple was ready the log was found in the sea, it had floated all the way from Krishna’s capital city of Dwarka. However the log was so heavy that no one could pick it up and again the tribal chief Vishwavasu had to be summoned and he carried the log to the temple. Now this sacred log called Brahmadaru had to be carved and no sculptor could even make a mark on it with their chisels. Then Vishwakarma, the architect of the gods answered the prayers of Indradyumna and appeared before the king in the guise of an old man. He said that he would do the job but on one condition – he was going to take twenty one days to carve the image and no one was to disturb him. The old man then locked himself into a room and people could hear the sound of hammering and chiselling. The twenty one days were still not over when one morning Indradyumna’s queen Gundicha realised that there was silence inside the room and she feared that the old man had died. In their anxiety Indradyumna and Gundicha opened the door and discovered an empty room and three half completed images. This is the legendary explanation of the unusual icons that we see in the garbha griha of the temple, welcoming devotees with their kind and compassionate smiles. The mythology of the temple is extended to another temple that stands at the other end of the avenue called the Gundicha Temple. This temple named after Indradyumna’s queen plays host to Jagannath, Subhadra and Balarama during the gorgeous pageant of the Rath Yatra. The three deities leave their home in three colourful chariots and spend ten days there before returning to the Jagannath Temple in a reverse chariot journey. As Puri is a very ancient pilgrimage site many religious scholars and reformers have visited it and have also established monasteries and temples. The Kalinga region has seen the presence of Buddhism, Jainism and then the worship of Lord Shiva, the sun god Surya and the goddess Devi became popular. For example most of the temples at Bhubaneswar are dedicated to Shiva and the Devi. Puri would become a centre for the worship of Lord Vishnu and his avatar Lord Krishna. The oldest monastery in Puri is the Goverdhan Math that was founded by Adi Shankaracharya, the Hindu reformer and scholar who led a revival of the religion in the 8th century. 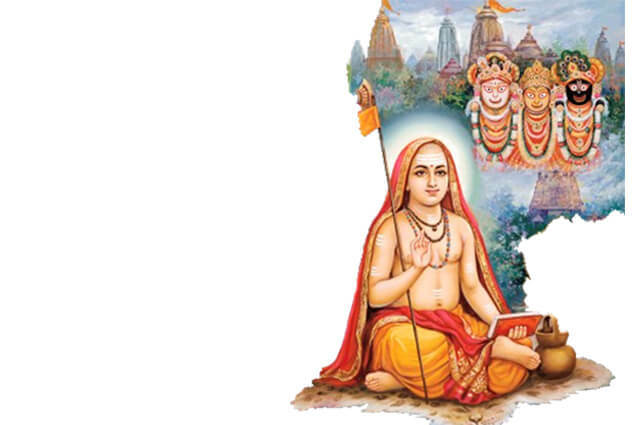 The saint and scholar Ramanujacharya came to Puri in the 12th century and supervised the rituals of the temple. Vishnu Swami established the Vishnuswami math in the 12th century. The poet saint Chaitanya Mahaprabhu lived here and his Gaudiya Math is among the largest monasteries in Puri. Finally in the 16th century Guru Nanak came here during his travels across the country. Today Puri has over a hundred monasteries and many temples are run by various Vaishnava sects. Most icons in Hindu temples are made of stone or metal but here they are of wood. The images that stand on the pedestal called ratnavedi are made of margosa wood and they are very simply carved unlike the traditional forms of most temple icons. The three images have large faces with wide circular eyes and broad smiles. Jagannath is painted black, Balabhadra is white and Subhadra is saffron coloured. The images are made anew every twelve or nineteen years in a ceremony called navakalebar. Historians feel that at one time Jagannath was a tribal deity as tribal communities of this region often worship a block of wood called a daru. The rulers of Kalinga had a large population of tribal people as their subjects and were thus keen to include a tribal deity in the Hindu pantheon. This explains the complex tale of Nilmadhav- Jagannath and even today the sabar tribe is intimately connected to the rituals of the temple along with the Brahmin priests. The Jagannath Temple is an example of the tolerant character of Hinduism that often absorbs many religious traditions. As with all the great temples of India, the Jagannath shrine is also a patron of arts and crafts. The Jagannath Temple has been the centre of not just religion but also of culture. In ancient times the temple had temple dancers called maharis who performed before the deities during the pujas. These dancers created one of the most beautiful of classical dance forms that we today call Odissi. For example the square chauka posture of the Odissi dancer symbolises Jagannath who is always worshipped before every performance. 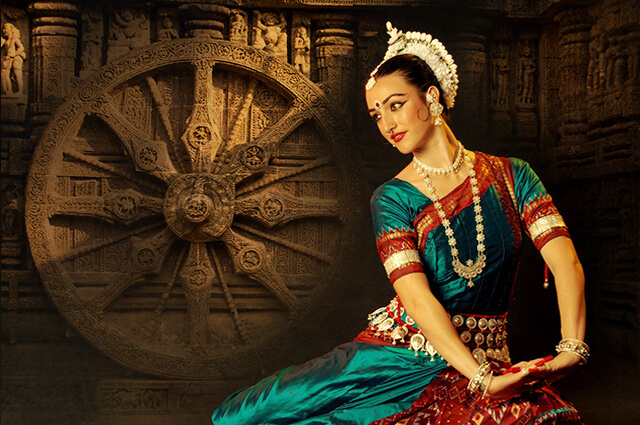 Many of the Odissi dance performances are based on the songs composed in Sanskrit by the Bengali poet Jayadev. His collection of poems written in praise of Lord Krishna called Gita Govinda is one of the classics of Indian literature and the hymns are sung everyday at the Jagannath Temple. 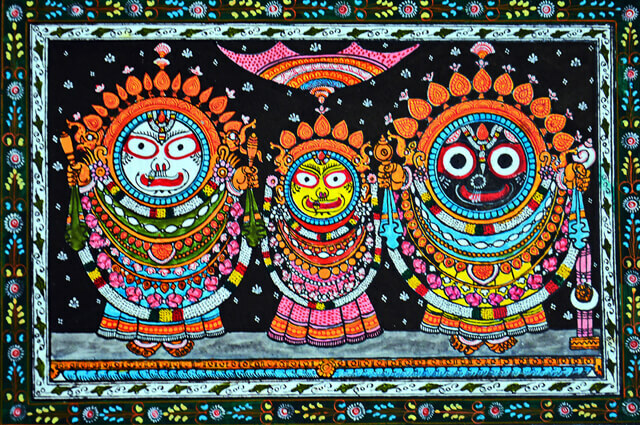 For Oriyas Jagannath is their most sacred and dearest god and he has inspired not just literature but also paintings, sculpture and a rich tradition of crafts like woven handlooms and carvings.